If you haven’t already, pull your turkey out of the freezer today – set it in a glass casserole/pan (catch all the drips!) and set it in the refrigerator. Microwaving your turkey is not a great plan – you can really dry out the breast meat as it will thaw quicker than the dark meat. If you’re new to roasting a turkey, there is usually a bag with giblets and the neck in the body cavity – don’t forget to remove it! While a lot of cooks think the contents of this bag is “gross”, simmer them with chicken or turkey stock for 30-45 minutes. Now use that stock for gravy or to moisten your dressing – it will add so much flavor! Your cat or dog will enjoy the giblets as their own Thanksgiving treat, and I usually remove the small amount of meat from the neck and add it to my gravy. If you want to do one more get-ready thing: pull out your table linens to to make sure they’re clean and give them a press – once less thing to take care of on Thursday morning! Now pour a glass of wine and enjoy the rest of your evening! 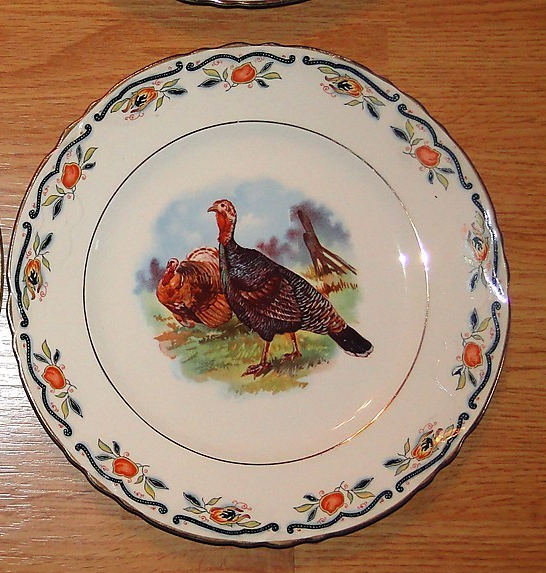 It’s November and Thanksgiving is just around the corner – I couldn’t be more excited! Not only is it my favorite holiday, but it’s my favorite holiday to cook for. Not everyone feels the same as I do – there’s a lot of pressure on for a meal that’s generally cooked just once a year, and it seems like lots of things can go wrong! I usually post a week-by-week plan to break it down into easy steps, but this year I think I’m going to just stick with one thing in each post and hopefully cover the few things that I think are really key to a great meal and less stress for the cook. GET YOUR KNIVES PROFESSIONALLY SHARPENED NOW! A dull knife can make a perfectly roasted turkey look terrible when it’s carved, and a less-than-perfect bird look like a disaster. Sharper knives will also help the chopping and slicing for your sides go quicker and look prettier too. 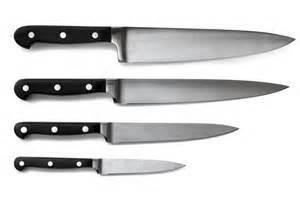 Check online for knife sharpening services in your area – many hardware stores offer the service and in our area, one grocery store chain’s meat department will sharpen knives at no cost. Remember that the service might take a couple of days, so that’s why I’m suggesting you do it now! 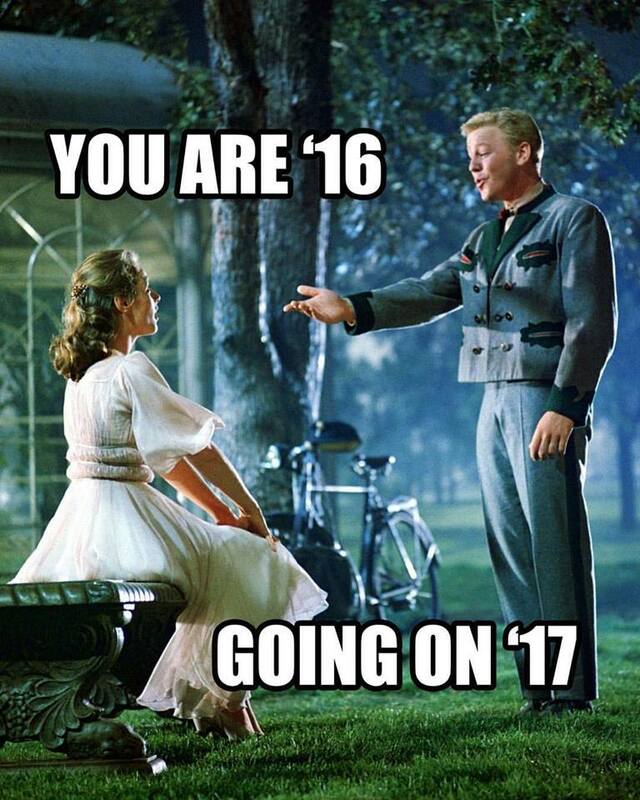 This only works once a century….hope your year is a good one! 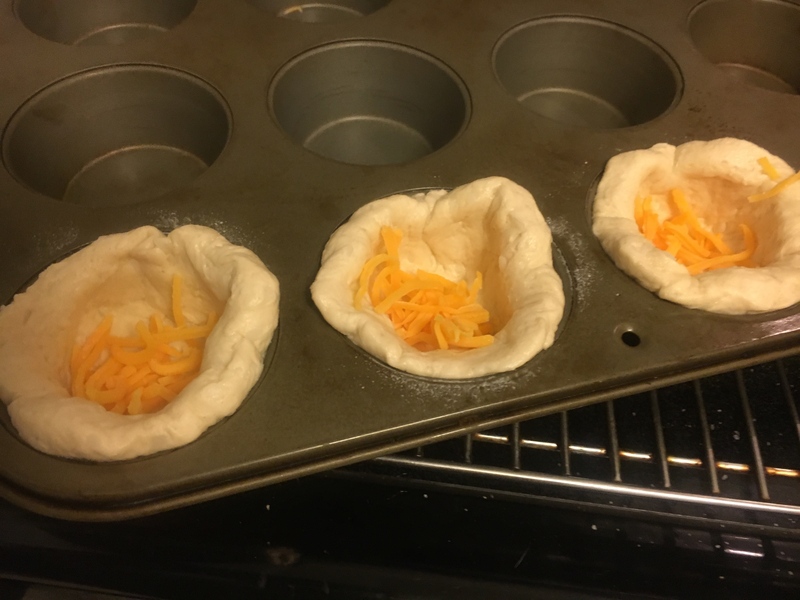 Muffin Tin Meals? My culinary school classmates roll their eyes when I talk about this kind of thing, but I DON’T CARE! They’re fun, easy, great for freezing, portion control and delicious! I also have this thing about getting kids involved in the kitchen to learn cooking and baking, and this is pretty simple as there aren’t any knives involved. Like a lot of ideas I post, I think of this as a “non-recipe” because it’s really just ingredients that you can put together as you like. 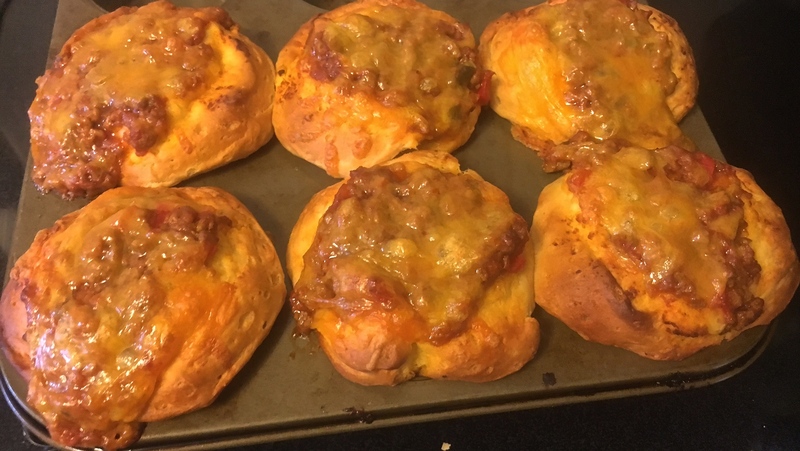 For my cooking demo at the Washington State Fair last week, I used canned biscuits (because they’re easy and required less work for my short time slot), home made Sloppy Joe sauce, and pre-shredded cheese. Of course you could use the canned mix for Joes and save yourself even more time, but if you’re looking for a great home-made version, find my delicious recipe by clicking here. So start with a can of refrigerator biscuits – there will be 8 in the can and as most muffin tins are for a dozen muffins, leave the two in the center empty. Spray the tin with non-stick cooking spray or grease them, then put a biscuit in each. Push them down and pull up to form “cups” – kids LOVE doing this! ..here’s another easy part…how long do you cook them for? Just use the guidelines on the biscuit can! Pop them in the oven (probably 350° or 400° for about 12 to 15 minutes) until the biscuits have browned, then remove and cool for 3 to 4 minutes before removing from the tin and serving. Make a big platter for halftime snacks on the next game day – they’re perfect for kid sleepovers too, and they freeze like magic. I make them and have on hand in our RV in case I’d rather be enjoying the outdoors than cooking. Now LET’S EAT! Preheat the oven according to the directions on the biscuit can, and spray or grease your muffin tin. Place a biscuit in each hole, then push down and pull up to form a “cup”. Place a bit of grated cheese in the bottom of each cup, then fill with Sloppy Joe sauce and top with more grated cheese. Bake according to time listed on biscuit can or until biscuits are golden brown. Remove from oven and let cool about 3 minutes before removing from tin and serving. For those of you who’ve followed my blog over time, you know that I’m smack dab in the middle of “Fair Season”. For those of you who are new to me and don’t know what I mean by Fair Season, I judge food contests and present cooking demos at state, regional and local fairs, and this is definitely the busiest time of year for it! This is the 3rd year for me to present a cooking demo at the Washington State Fair, and I had the idea I’d create “Muffin Tin Meals.” There are a lot of great reasons to use a muffin to make something other than a plain old muffin: they cook quickly, they’re only a few bites which makes them great for snacks, game day food, tailgating, a light lunch with salad, camping or RV travel. Their simplicity makes them easy for kids to help prepare, they’re easy to freeze which makes them great to pull out at the last moment if you pack a lunch for work, and most importantly for me…PORTION CONTROL! Of course, they’re also a lot of fun to make and eat. As you’re figuring out what you want to create, their smaller size means you can easily change them up without having to make a huge batch or wait a long time for baking if your recipe needs some work. I also designed the recipes for the demo so you could easily substitute ingredients for a time-saving can or box here and there. In the case of the following Chicken and Green Chile Corn Muffins, you could use your own roasted chicken breast, deli roasted chicken or even canned chicken to make it work (have you tried that white meat chick in the blue can at Costco? It’s amazing!) 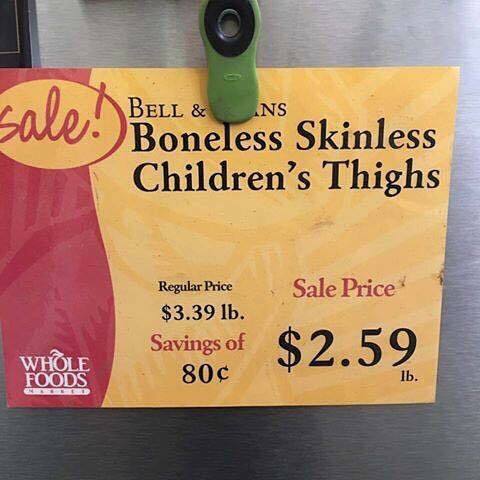 So, what are we having to EAT?! Start with a corn muffin recipe that yields 6 to 8 muffins. 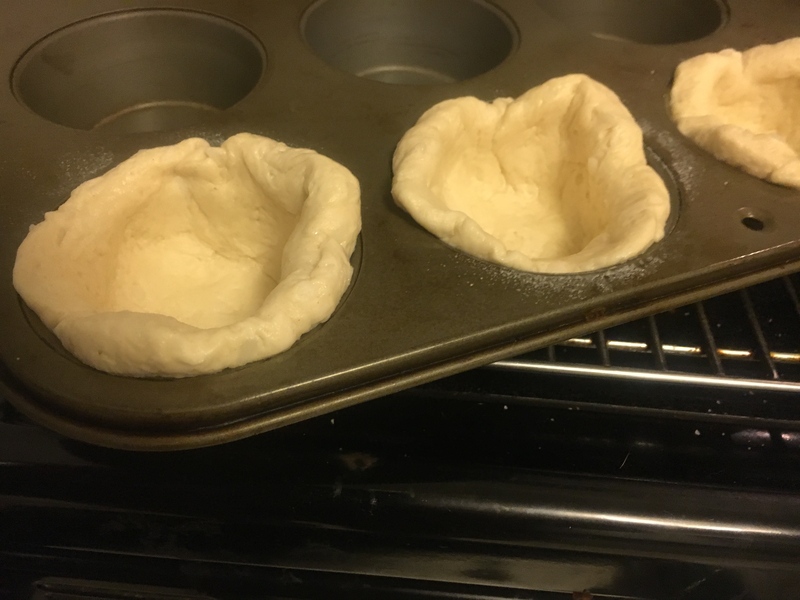 You can make it from scratch or use a boxed mix – I used a Jiffy muffin mix that makes 6 muffins…. …we can’t forget our secret ingredient – Tapatio! Just 3 or 4 drops doesn’t make it spicy, but really deepens and rounds out the flavors. Trust me! …now cook them according to your recipe directions – isn’t that easy? You’ll probably want them in the oven about 15 minutes at 375° or 400°. Look at how gorgeous they are when they’re done! I like to garnish mine with a little sour cream and some chopped green onion or cilantro. What a perfect light meal! I like to call this a “non-recipe” because you can change it up to suit your taste…maybe you’d rather put in pepperjack cheese, or some cooked chorizo, or red and green bell pepper, or don’t add any meat so it can be vegetarian. Make it your own and take all the credit for the “YUM!” you’ll hear from your hungry eaters! 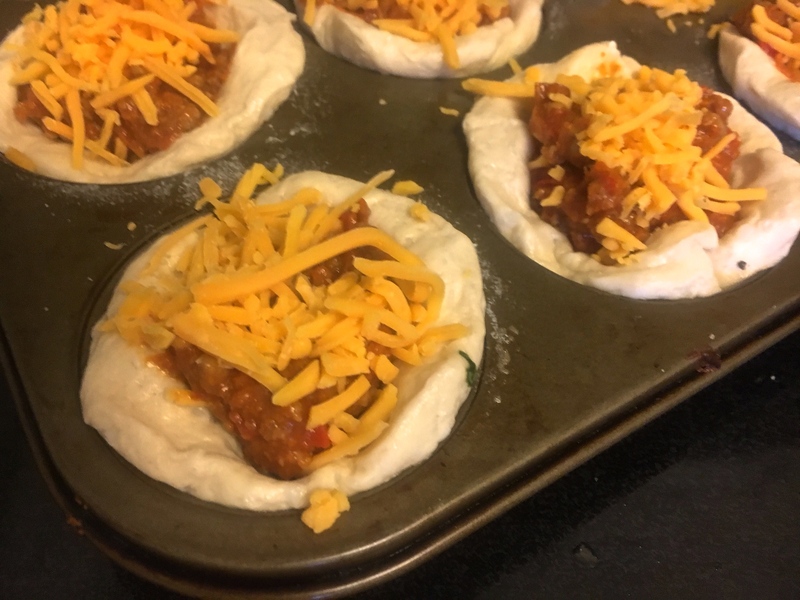 Check back for my other Muffin Tin Meal recipes I’ll be posting this week – Sloppy Joe Biscuits, Breakfast Omelettes and Broccoli Cheddar Muffins. And, I’ll be posting lots of pics and delicious recipes from judging at the Western Idaho State Fair, the Oregon State Fair and the Central Washington State Fair the past few weeks. Heat the oven to the temperature indicated in your recipe – probably 375° or 400°. Make your cornbread recipe in a large bowl – your own recipe or a mix, either works great. Add the shredded or cubed chicken, chiles, cheese and spices together and stir to combine all ingredients. Line 12 muffin tins with paper or foil liners, and coat them lightly with non-stick cooking spray. You really need to use the liners! Add chicken mixture to each cup. Bake according to muffin recipe directions until the cornbread is golden brown. Remove from oven and cool 3 to 4 minutes, then garnish and serve. *If you saw my cooking demo at the Washington State Fair, this is a slightly different version than I presented. All the ingredients are the same, but one lady during the demo asked “Couldn’t you just mix everything together?” What a great idea! So with that suggestion, I’ve now combined everything rather than doing them in layers. I think it works a lot better! This is a little something that’s quick and easy, and makes the most of delicious, fresh corn that’s really abundant this time of year. Of course, it’s SO DELICIOUS you’re going to want to keep making it for the rest of your summer BBQs, picnics and family reunions! The longest part about assembling this salad is grilling the corn. The dicing and grating of the other vegetables and mixing the dressing help fill that time pretty quickly. I love how grilling the corn brings out so much sweetness in it, and the contrast/bite of the vinegar, lime juice and red onion in the salad is a great complement to it. This is delicious on its own, or throw some grilled chicken or pork with it and wrap it in a tortilla for a quick lunch or afternoon snack. If you’re feeding more people, you can easily add (or substitute) diced red and/or green pepper, grated or julienned jicama, diced cucumber or even black beans to make a meatless main dish (depending on how much you add of the other ingredients you may need to increase the dressing accordingly). Mix together all ingredients for dressing and whisk until combined. Toss together remaining ingredients with dressing. Refrigerate at least 15 minutes before serving. Divide into 6 equal servings about 1 cup each. *Note: If you can’t find fresh corn-on-the-cob, you can substitute canned or frozen kernels. 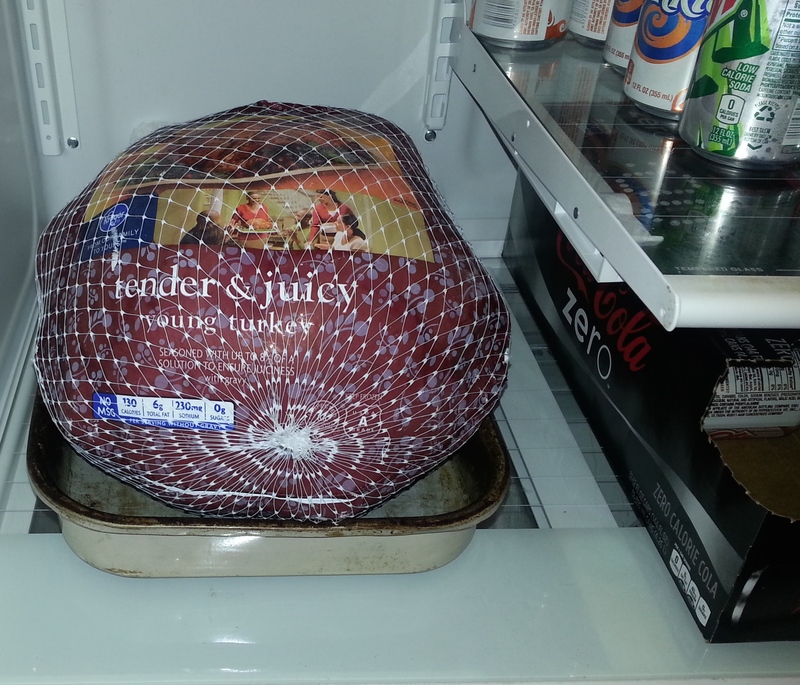 If using frozen, thaw first; if using canned, drain it well. Toss into a hot skillet (preferably cast iron) with a tablespoon or two of olive oil and cook four to five minutes until cooked through and the kernels get some nice brown/char to them. Checking your work is SO important….. I love summer. It brings back memories of childhood spent at my grandparents’ house on the beach and pool parties, scavenger hunts, miniature golf, croquet tournaments and big family parties filled with delicious food. I celebrate summer today with BBQs at my own house, marshmallow roasts on our patio, attending my nephew’s baseball tournaments, time spent with friends and the abundance of fresh produce available at the farmer’s market and the grocery store. But I also love summer because of YARD SALES! We can hardly be in the car for five minutes on a weekend outing without me yelling to Rolland “Pull over! There’s a SALE!” Beyond the crazy stuff I’m always looking for – vintage linens, mid century furniture, old paintings of people and/or dogs, vintage Barbie dolls – I love finding old church and hospital guild cookbooks or boxes and notebooks stuffed with handwritten recipes, items ripped from magazines and newspapers and glued onto index cards. They’re entertaining – who would EAT this stuff?! – and every so often, I find something I want to try out. This recipe was inspired by one of those recent yard sale cookbook finds – It uses my favorite comfort food – RICE! Give me a steaming bowl of white rice with some butter, salt and pepper, and I’m a very happy guy. I’m constantly looking for new ways to prepare rice, and right now I’m on my salad kick. I also like dishes that require minimal cooking because it’s been unusually hot for a Seattle summer and the last thing I want to do is heat up my tiny, un-air conditioned house any more than it already is. 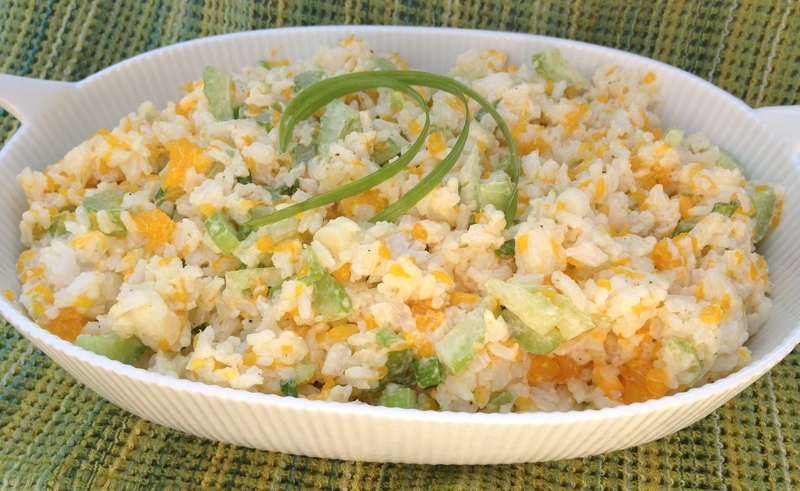 When it gets this hot, I find I want to cool down with something citrus, so to combine rice with citrus is a home run for me. I streamlined this a bit and made a couple changes from the guild cookbook (a few too may canned vegetables in the original for my taste), and I love the result. The colors are so fresh and vibrant! I like the vintage taste of this with the mayo dressing. It looks terrific served in a big lettuce cup. You start with 2 cups of uncooked white rice – I use the juice and zest of a lime in this dish, so start with the juice of your lime in your measuring cup, then add water to make 4 cups, add a teaspoon of vegetable oil and cook for 15-20 minutes. You want to cool the rice after it’s done – if you’re using a metal pan to cook your rice in, remember that metal is a heat conductor, so it won’t cool quickly in the pan. Just spread it out on a plate – it shouldn’t take more than 30 minutes to cool enough to use in the salad. There aren’t a lot of complicated steps to this dish – HOORAY! 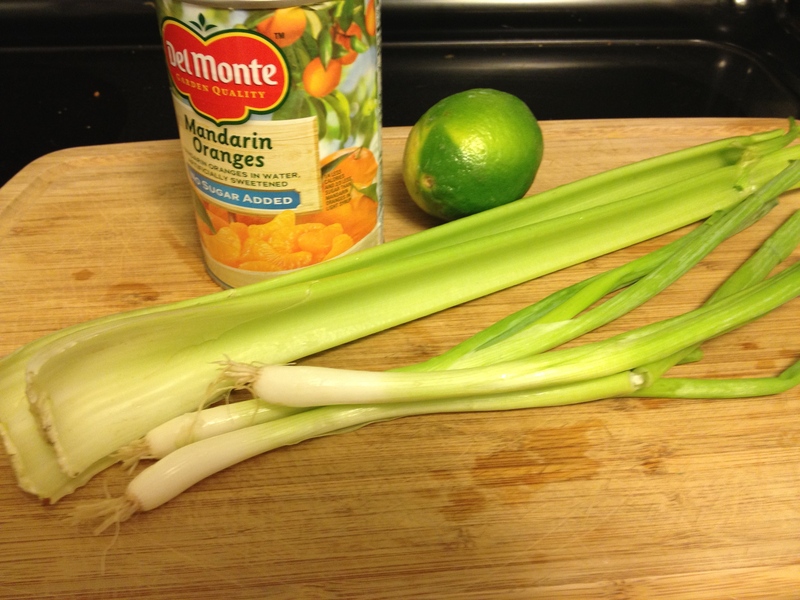 – so while the rice is cooling, get out two stalks of celery, three green onions and a large can of Mandarin oranges. I like to use no sugar added because Rolland is diabetic and the sugar in the oranges along with the carbs of the rice is plenty for him, but if you prefer to use oranges in syrup, that’s fine. Drain the oranges really well…. 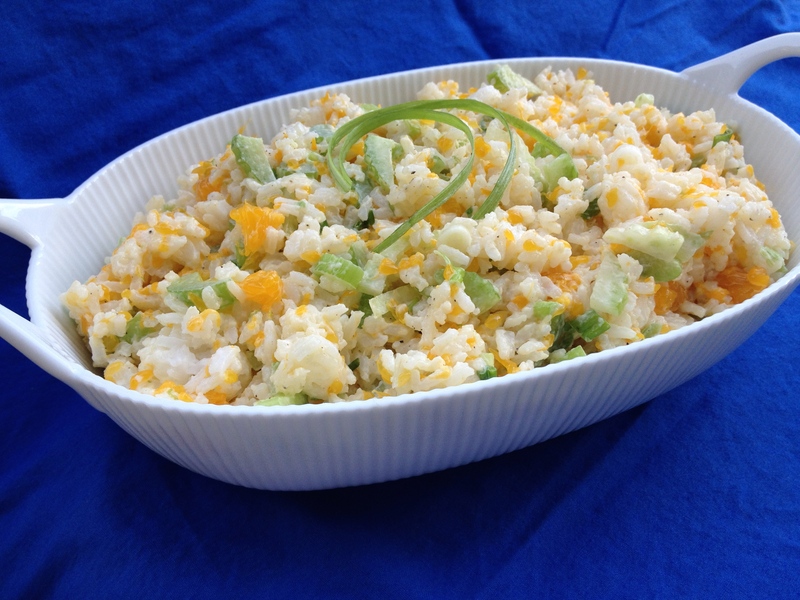 …just before serving, put the rice in a favorite serving dish and garnish with a little of the green part from the onion – beautiful and DELICIOUS! Put the two cups rice into a saucepan – put the juice of the lime into a large measuring cup then add water to make 4 cups. Cook 15-20 minutes until tender. Pour onto a plate to cool for about 30 minutes. 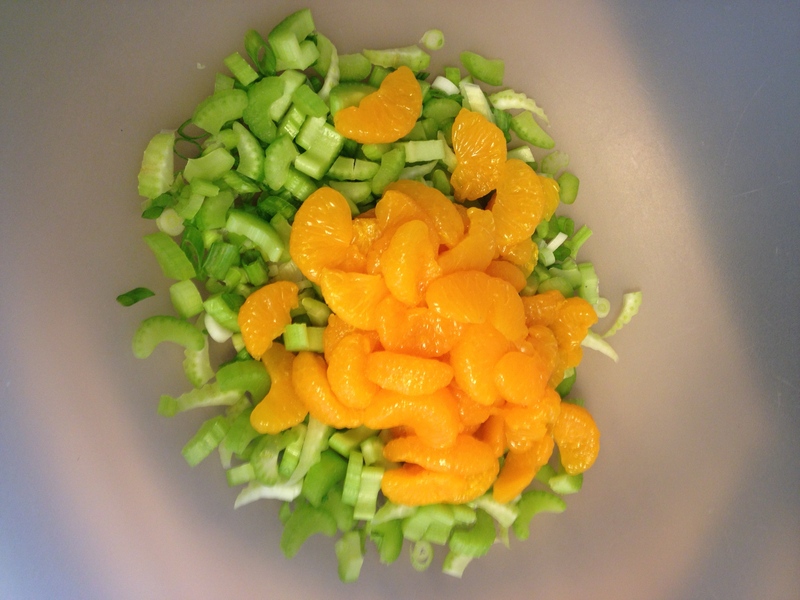 Drain the Mandarin oranges well while you chop the celery and green onions, then them all into a large bowl. 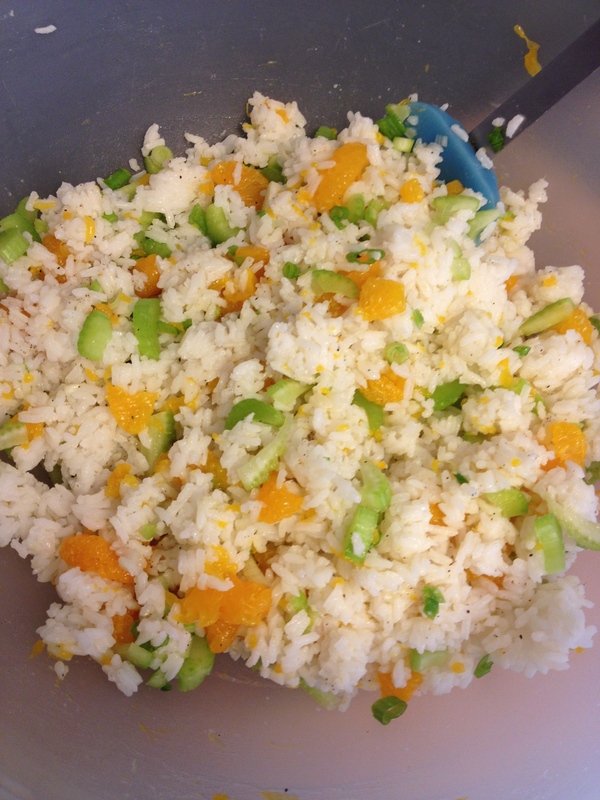 Add the cooled rice and mix it all together gently. Add the mayonnaise, lime zest, salt and pepper and mix them gently into the salad ingredients. Before serving, adjust seasoning, transfer to a serving dish and garnish with green onion of desired. If you are a diabetic, cook for/live with a diabetic, or you just watch your carb intake, you know how frustrating it can be to attend a company picnic or family reunion where the table is loaded with delicious stuff that’s a disaster for blood sugar levels. You can take the safe bet and bring a vegetable tray, but that’s not the best option if you know you’re going to be tempted by classic high-carb picnic favorites like potato salad. 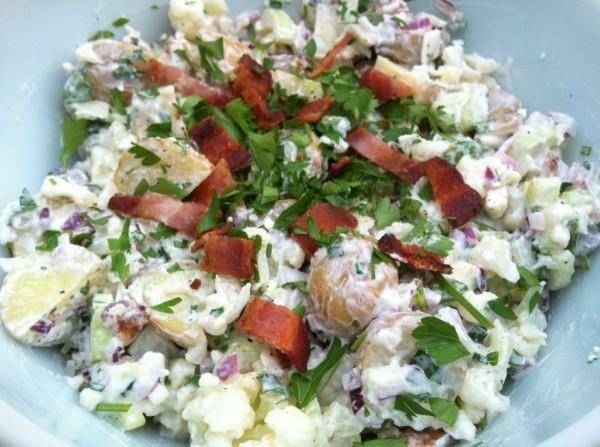 Potato salad is difficult to include in a diabetic diet without strict portion control. And when it comes to potato salad, I’m really not interested in portion control. But wouldn’t it be awesome to add a carb-friendly version to the feast that people rave about, rather than another tray of radish roses and carrot sticks? One of things I make to accommodate the low-carb needs of our household is “mashed faux-tatoes” – if you’re not familiar with these, you substitute some of the potatoes for cauliflower. Once it’s boiled, seasoned and mashed with the potatoes, it’s difficult to tell you’re not serving 100% of Idaho’s finest. I usually use about 1/3 cauliflower and 2/3 potatoes for this. Because it’s not as dense, I throw the cauliflower in halfway through the potato cooking time to make sure it still has some body left when it’s time to mash them. Add a little chicken (or vegetable) broth and/or non-fat sour cream, salt and pepper, and you’re good to go. So if I could do that with mashed potatoes, I wondered, couldn’t I do the same thing with potato salad? YES! After a little experimenting, I found the key to it is using a waxy potato and not overcooking the cauliflower, which I think is much easier to accomplish in the microwave. Scrub the potatoes and cut into bite-size pieces – potatoes should be small enough that “bite-size” is only two or three cuts each. Place in a microwave-safe bowl and cook on high for 3 minutes. Stir and cook on high for 3 minutes longer – potatoes will continue to cook after removing from microwave, so don’t cook until soft. If after resting 5 mintues potatoes aren’t “fork tender”, microwave on high an additional minute. In a microwaveable bowl with lid, put in the cauliflower and 1 Tblsp water. Microwave on high for 2 minutes, stir, and cook 2 more minutes on high. Remove from oven, drain and allow to cool. As with the potatoes, these will continue to cook once removed, if not fork tender after 5 minutes, microwave on high 1 minute longer. 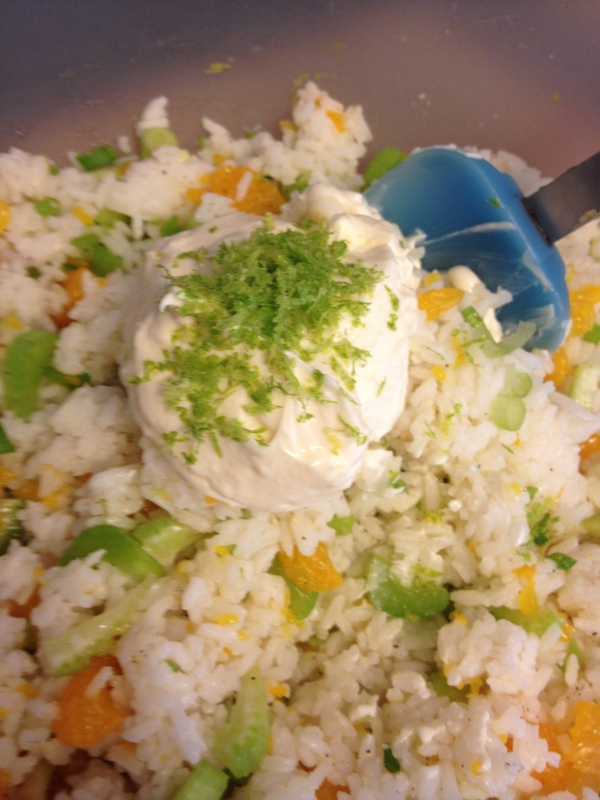 In a small bowl, combine the sour cream, lemon juice, zest, oil, salt and pepper and stir to combine. Stir in the Gorgonzola and chives and set aside. In a large serving bowl combine the potatoes, cauliflower, onion and celery. Stir in the dressing and refrigerate for at least one hour. Just before serving, taste and adjust seasoning, fold in bacon crumbles and garnish with chopped parsley. Remember, just because it has fewer carbs doesn’t mean there’s no need for moderation. 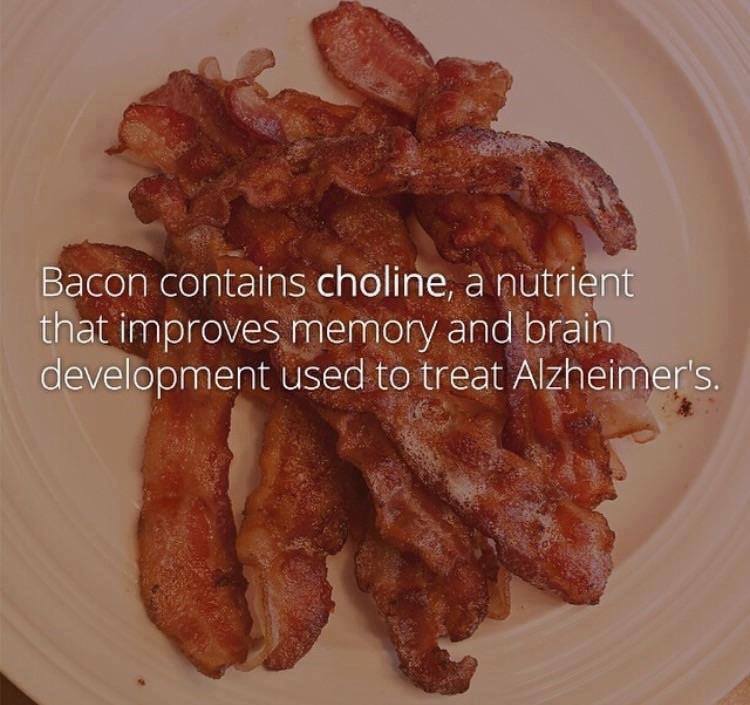 You’ll WANT to eat the whole thing, but share with several others for optimum benefits to your health. P.S. You can easily adjust this for your vegetarian and vegan eaters by removing the bacon (or substituting veggie bacon), a vegan-friendly cheese and mayo.